Industry. To better manage their assets the industry requires a way of predicting the remaining service life of their pipes. In order to do this a predictive model of long-term corrosion loss with time is required. 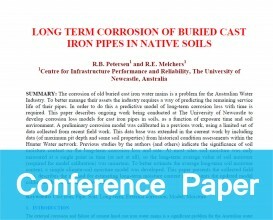 This paper describes ongoing work being conducted at The University of Newcastle to develop corrosion loss models for cast iron pipes in soils, as a function of exposure time and soil environment. A preliminary corrosion model was calibrated in a previous work, using a limited set of data collected from recent field work. This data base was extended in the current work by including data (of maximum pit depth and some soil properties) from historical condition assessments within the Hunter Water network. Previous studies by the authors (and others) indicate the significance of soil moisture content on the long-term corrosion loss and rate. At most sites soil moisture was only measured at a single point in time (or not at all), so the long-term average value of soil moisture (required for model calibration) was uncertain. To better estimate the average long-term soil moisture content, a simple climate-soil moisture model was developed. This paper presents the collected field data, describes the method for estimating long-term moisture content and presents the updated model calibration based on the additional data.